Wednesday, December 10. There hasn't been much to write about yet this week, as it has been all about working. They asked if I could work a full day yesterday, but it was a slow one, so I left at 3:00. This afternoon, just before I left, they called a meeting with the receptionists and all 3 managers. A disgruntled customer that had checked in this morning was not happy and he wrote a lengthy email to the manager. It wasn't me at the desk, and from what I could hear from the next room, he was treated with respect, but he didn't appreciate a comment that he was given (in a joking manner) about his aggressive behavior. His wife was ready to count out the cash for their payment of $600 and he grabbed the money from her hand and started to count it and slap it very angrily on the counter. The meeting was just to tell us that we should call a manager to deal with this type of person if we feel uncomfortable at all. In my eyes, no wrong was done and the customer was definitely not nice. I feel sorry for his wife. 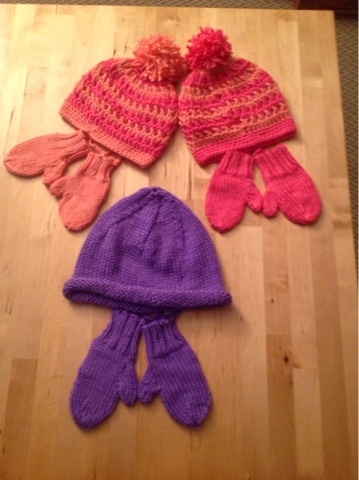 I am struggling with the 4th of 6 mittens, Christmas gifts for the grandkids. Darn! I have had to restart, correct, and rip out this one several times over the last week and I just can't get it right. I had it finished but it was slightly smaller than the last one - an unmatched pair just won't do. Now I'm feeling under pressure because I just have to get that package in the mail by the 15th at the latest. Tomorrow is the day! We have finalized our decision on when and where to have our family reunion. The consensus was for the weekend of July 10-12 at Basswood Resort in Platte City, MO - a nice central location for family that will travel from Stoughton, Minneapolis, Wichita, Cedar Rapids (maybe), and southern Missouri. The place looks very nice and several of us have already made reservations. Friday, December 12. Well, I got my house cleaned and finally finished knitting mittens. Now, the box of gifts is packed and ready to be shipped - ahead of schedule by 2 days. They turned out really cute. Pat, Roger, and I tried the Black Bear Diner for fish fry tonight and I don't believe that I will return. It is another place that gives you generous portions of not the greatest food. I saw more obese people there and figured that might be an indicator. You just don't know until you try. Sunday, December 14. Yesterday, I got all of the Christmas packages for the grandkids wrapped and packaged up for shipping. Then, later on, I got it shipped off. Today, I finished working on the annual family birthday calendar and Christmas cards done. Yay! IKEA instead - Pat had never been there before. So, despite the fact that we both took only short walks with our dogs this morning, we got a good walk in at Ikea - that place is huge - like a football field and we walked both floors. I don't know what it is about the store, but I like it. I helped Arlene out up some Christmas lights this afternoon and they look nice.